NEW YORK -- So often, we want to make a difference but aren't sure how to make the most of our time and money in giving. 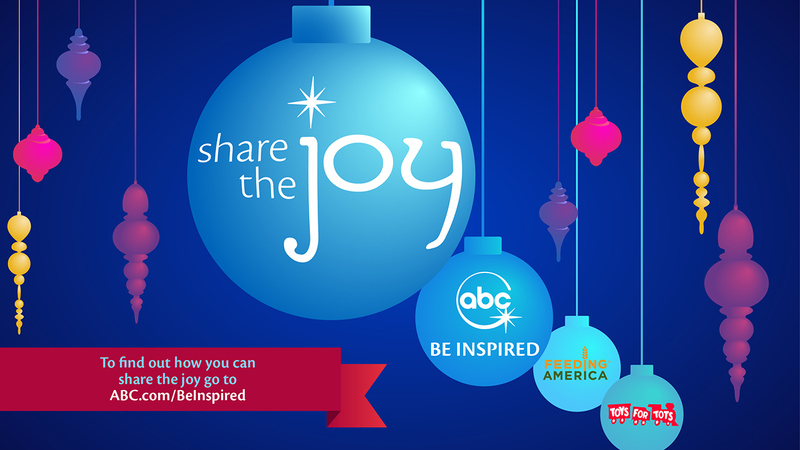 That's why Disney and ABC are teaming up with groups who can help you do just that through our "Share the Joy" campaign. Disney, ABC and Feeding America are working to keep kids healthier by expanding access to fresh produce and nutritious foods in communities where it's needed most. Disney has announced a $1 million donation to Feeding America to help strengthen communities. To learn more, visit FeedingAmerica.org/BeInspired. Feeding America every supports food banks' abilities to deliver nutritious foods to kids after school, create access points within communities throughout the country and provide food-insecure children with nutritious meals that will fuel creativity in their school and play. Disney VoluntEARS, Cast Members, employees and others will donate thousands of new, unwrapped toys to bring joy to kids and families in local communities. Join us! Donate a toy to a deserving family today through ToysforTots.org/BeInspired. Disney's relationship with Toys for Tots began in 1948 when Walt Disney and his animators personally designed the original Toys for Tots train logo that is still used today. This day of global day of service celebrates the power of families who work together to strengthen their communities. As the sponsor of Family Volunteer Day on November 18, The Walt Disney Company, with Points of Light, will offer family-friendly events around the world to share the joy with those who need it most. To learn how to plan or find a family-friendly project near you, visit generationOn.org/FVD. Pressed for time this busy holiday season? You can adopt-a-child in need online, in only minutes. No need to go to a store or mail a check: You can grant a foster child's holiday wish through One Simple Wish. One Simple Wish brings national attention to the foster care system, bringing love, hope and joy to tens of thousands of children all over the United States/. Find ways you can make a real difference this holiday season. One more way to help: Share the word with others!